When “How the Grinch Stole Christmas” first aired on December 18, 1966, the most optimistic projection for the cartoon was a ten-year run. Almost half a century later, it has exceeded all expectations, becoming a cherished Christmas classic eagerly awaited by millions every holiday season. It was a hard sell. Chuck Jones, the legendary animator from Warner Brothers, wanted to give life to one of Ted Geisel’s (Dr. Seuss) classic books. Geisel was a friend of Jones’ and admired his work. But he was still hesitant to agree to the project, and said no at first. Between Chuck’s charm and his wife’s coaxing, Ted finally relented. They decided to work on an animated version of “How the Grinch Stole Christmas”. Turns out getting Geisel on board was the easy part. MGM was not thrilled about producing it, and the project was rejected 20 times before Foundation for Commercial Banks agreed to sponsor it. The story of the Grinch, set in Whoville, was based on Ted Geisel’s hometown of Easthampton, Massachusetts, and the Grinch’s mountain was inspired by nearby Mount Tom. Reading the book aloud took just over 10 minutes, making it necessary to add additional dialogue and songs to lengthen it for TV. The classic mountain scene was created specifically for this purpose. Max the lovable dog became a main character in the cartoon thanks to Chuck Jones. Max was the identifiable character, the audience’s point of view in the film. Even though the Grinch is always a jerk to him, Max still loves him unconditionally. And who doesn’t love watching Max take that ride down the mountain? 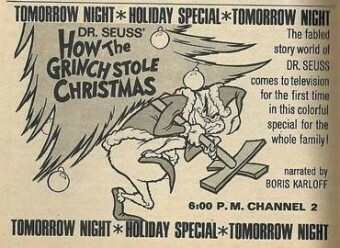 The cartoon was the most expensive animated program ever made for CBS at that point, but Chuck Jones insisted on doing “The Grinch” correctly. 250 backgrounds were used in making the cartoon, and a 34-piece orchestra was brought in for the musical numbers. Chuck and Ted were stumped on how to end it, but came up with the perfect solution – all the Whos down in Whoville holding hands, singing.